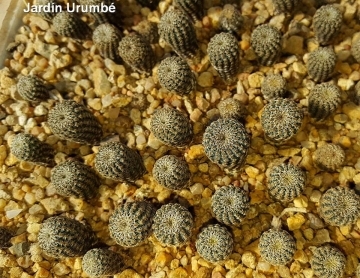 Origin and Habitat: Frailea phaeodisca occurs in Brazil (Rio Grande do Sul) and Uruguay (extent of occurence approximately 80,000 km2). The subpopulations in Brazil are not abundant; the species is never found in large numbers. In Uruguay it is relatively common. Altitude range: up to 300 metres above sea level. Habitat and Ecology: The species grows on rocky outcrops and stony fields in pampa grasslands, but it is not abundant and many places where the species was once found have suffered a complete conversion of the land. It is estimated that 40% of the population has disappeared in the last 20 years due to threats that are known, but are not reversible and have not ceased. Generation Length 7 years. The major threats to this cactus are grazing and cattle trampling, agriculture, Eucalyptus forestry, invasive grasses and fire. Echinocactus pygmaeus var. phaeodiscus Speg. 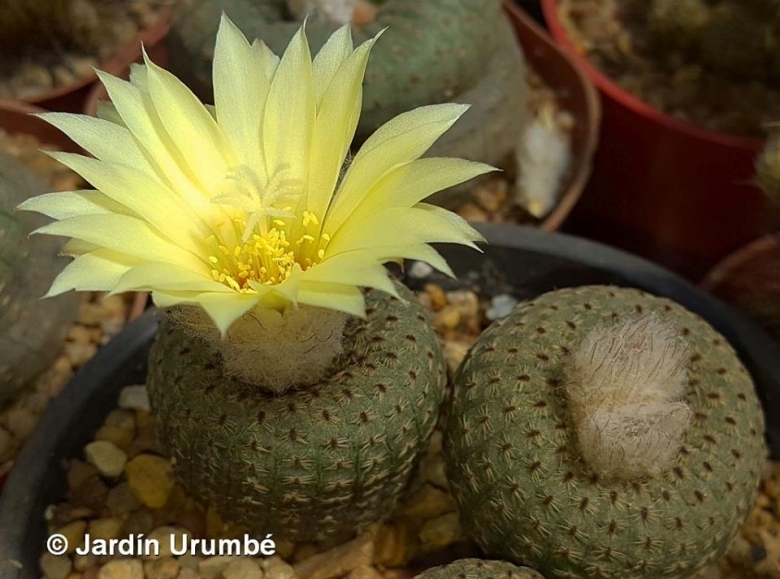 Description: Frailea phaeodisca is a very singular miniature plant with a disk like body, and one of the most attractive species of Frailea, along with Frailea castanea and Frailea buenekeri. The genus is cleistogamous, the colour of the flower is yellow. Habit: It is a small solitary (unless damaged) perennial stem succulent that grows deep seated flat to the ground surface. Only in cultivation plants may have a spherical till columnar shape. Roots: While Frailea asterioides has a fleshy napiform root, Frailea phaeodisca has a long, tapered fusiform root, with fine lateral diffuse roots. Stem: Simple, disk-shaped to flattened globose, 1,5-3 tall, 1,5-5,5(-7) cm in diameter pale to dark grey-green or dark brown. Ribs: 22-26(-30) completely flat or divided into very low tubercles and recognisable only by the straight, dark, vertical line marking each sinus, with dark purple-brown lunate, markings beneath the areoles. Areoles: Elongate with violet-black or brownish black felt. Spines: Many, not differentiated as centrals and radials. Radial spines: 6-14 small, pectinate, not interlaced 1-2,5(-4) mm long, glassy white, brownish black at base, completely adpressed. Flowers: 2,2-3,5 long, 2,2-4 cm in diameter, tepals acuminate, sulphur-yellow or paler. Stigma-lobes 6-7 up to 3,5 mm long. Seeds: 1,5-2 mm long 2,1-3 rum broad, shiny, dark brown, smooth, hilum narrowly oblong-ovate. Remarks: Frailea phaeodisca is a poorly understood taxon that is sometimes regarded as no more than a variety of another dwarf species, Frailea pygmaea. Frailea schlosseri Prestlé: has dark grey-green disk-shaped stems with dark purple “moons” under their areoles. Distribution: North-west Paraguay. 10) Larocca, J., Machado, M. & Duarte, W. 2013. Frailea phaeodisca. The IUCN Red List of Threatened Species 2013: e.T152919A694824. http://dx.doi.org/10.2305/IUCN.UK.2013-1.RLTS.T152919A694824.en. Downloaded on 19 August 2016. Cultivation and Propagation: Frailea phaeodisca is a summer grower species relatively easy to grow. It is sometime seen as a grafted plant but grows very well on its own roots too. Characteristically, during the dry season plants retract completely under the ground both in the wild and in cultivation too. good idea to keep restarting them from seed; what looks like a healthy big plant may suddenly die of old age without warning. Hardiness: They need a minimum temperature of 5-10° C (but occasionally temperatures of a few degrees below 0° are not dangerous if kept on the dry side prior to, and during, cold weather). It tends to rot in winter during the resting phase, if kept wet. In the rest period no high atmospheric humidity!! Sun Exposure: Light shade to full sun, its colour tends to richer and darker when grown in light shade. In a shaded position the plants grow faster, but are not flat shaped and dark coloured. Propagation: With fresh harvested seeds or (rarely) by grafting. Fraileas set seed (when well grown) and grow easily from seed. In fact, they are reported to set seed even if the flower doesn’t open. This self-fertilization is called cleistogamy. Seedlings dislike strong light and dry conditions and need to be repotted frequently during the first few years. However, old plants become senile and have a tendency to succumb to disease and a weak root system. At this stage, as is well known, they die suddenly. So, after they reach about 4-5 cm in diameter grow them slowly, and adopt a new repotting period, using intervals of every 3-4 years. Additionally grow them under drier conditions or with stronger sunlight. But plants are sometine grafted to accelerate growth, but the grafted plants are typical rather tall growing, compared with plants on their own roots that are usually more flat to the ground.